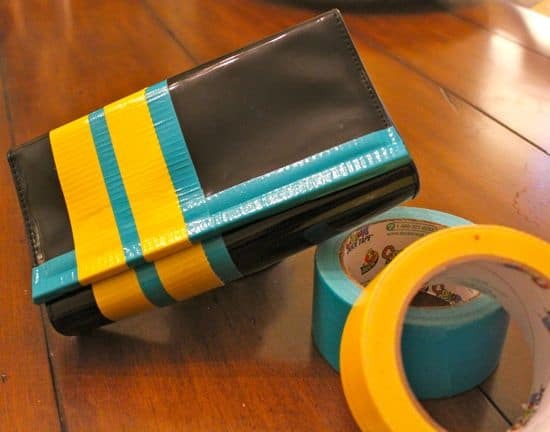 I caught about 3 minutes of the Nate Berkus show and saw an amazing idea for updating a plain ol’ purse into a fun color block wonder. 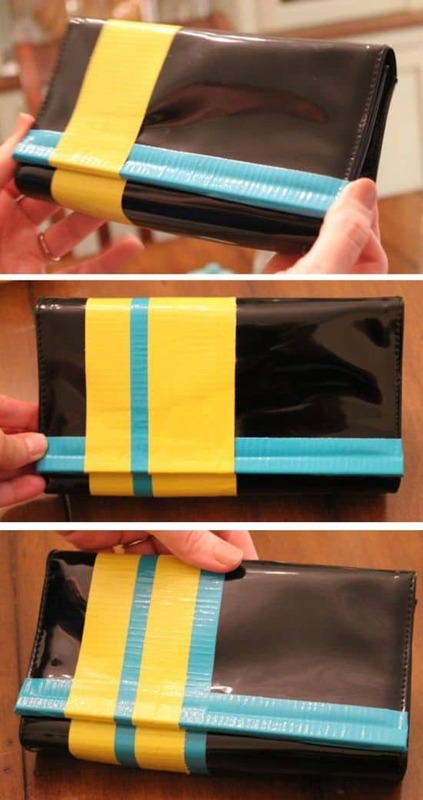 Is there anything duct tape can’t do?! When I found a cute clutch at Goodwill for $1.50 I had to try it. And I recommend doing this project with a friend. My friend Nikki – whose hands appear in this blog, like, a lot – is so fun to craft with. She and her adorable brood came for dinner on Tuesday, and it was the best time. Food was awesome if I do say so (mahi mahi with mango, avocado, cherry tomato salsa and homemade mint chocolate chip ice cream), and our kids played like angels. It is so much more fun doing this stuff with other ladies. Wouldn’t a craft night be fun? My best projects seem to happen with a little wine involved. Anyway, back to the purse. 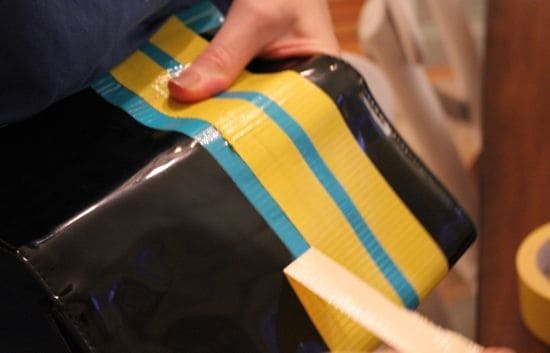 Step 1: Try to visualize how you want to layer your tape. But if you end up changing your mind, it’s not a big deal because you can lift the tape (we did). For this purse, we put down a layer of turquoise horizontally to cover the gold closure. Snip the corner so you can fold down the edges. Step 2: Layer the tape horizontally. We did 3 layers: yellow, turquoise, and yellow. Step 3: You can tear the tape if you want the last band to be thinner and show the turquoise underneath. What do you think? I kinda love it! My kiddos and I are so into duct tape too! 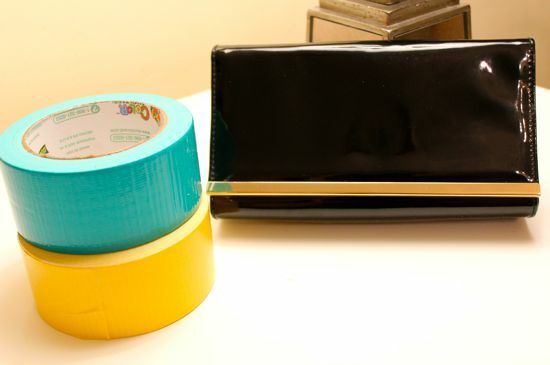 Stop by my blog tomorrow and check out a recent duct tape project we did. Wow that is easy and neat. I prefer the no-paint ideas for DIYs. They are a lot easier and quick. Thanks for sharing! Oh my gosh. I love this! Amazing! Yes, the dinner WAS delish!! Thanks for letting my kids drag out every single toy…. This is so smart! I never would have thought of that. I didn't even know they made colored duct tape? I need to obviously pay more attention at the craft store! This is really, really adorable, and your craft night sounds real fun! I love this idea! Not to mention, your clutch turned out great! Thanks for sharing! So true! It's like spray paint – a must have! This is such a good idea!!! Don't you just love the Nate Berkus show? He's a genius! You did such a good job with this purse! 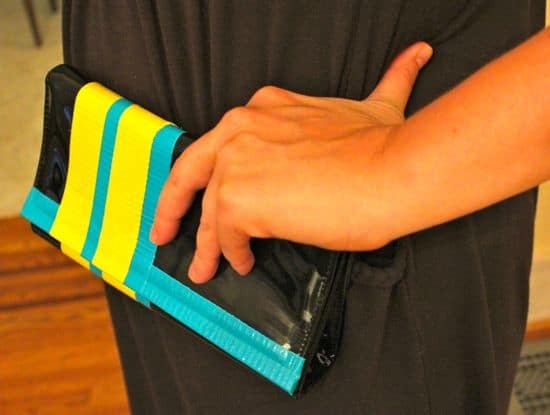 i saw somewhere this week that a blogger decoupaged/modge podged a clutch! it was so cute!! How fun! I love me some modge podge too! Aww, thank you :) You made my day!